Potato chip lovers everywhere can unite over this crunch-a-licious Garlic and Parmesan Potato Chips Recipe! With just 1 Point per serving, you can enjoy a nighttime nosh without the guilt. Save your money and avoid buying those expensive bags of low calorie potato chips at the grocery store and just make your own! They are SO much yummier and better for you. 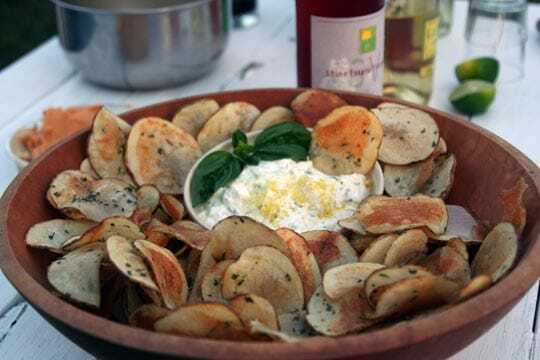 Though this is not an official Weight Watchers Potato Chips Recipe, it’s a great, low calorie snack idea for anyone who wants to enjoy a snack without sabotaging their weight loss goals. Preheat oven to 400°F. Slice potato into very thin slices using a mandolin slicer. In a large bowl, spray the potato slices with the cooking spray. Add in cheese, chives, and salt and toss gently to coat. Arrange potato slices in a single layer on baking sheets coated with non fat cooking spray. Bake at 400°F for about 18 to 20 minutes or until golden. I used this recipe. I live in GA, so no high altitudes. Unfortunately, I used the thinnest slice size on my mandolin ( I only have 2: thick and thin) and I preheated my oven to 400 degrees Fahrenheit. It was WAYY too hot and half way through, half of my chips burned. :( I turned the oven down to 350 and hope the next batch will look more like the ones in the picture. Also, instead of using chives I used Rosemary and it was delicious on the few chips that turned out alright. I would just suggest a lower cooking temp and to keep an eye on your chips! Great info…thanks for sharing! Getting chips to cook to the right texture is REALLY tricky, and often takes a lot of trial and error with different temperatures and methods.